Therein lies the rub …..
I’m currently on a bit of a bacon crusade. Certain members of my family call me the Boss of Bacon and at times in my fantasy world I imagine myself defending innocent bacon lovers against the perils of pumped commercial bacon. My musings have not yet progressed to what super hero outfit I should wear and the thought of wearing tights is not that appealing so I will leave it to Gaga to do the public, meat wrapped display while I focus on this blog instead. 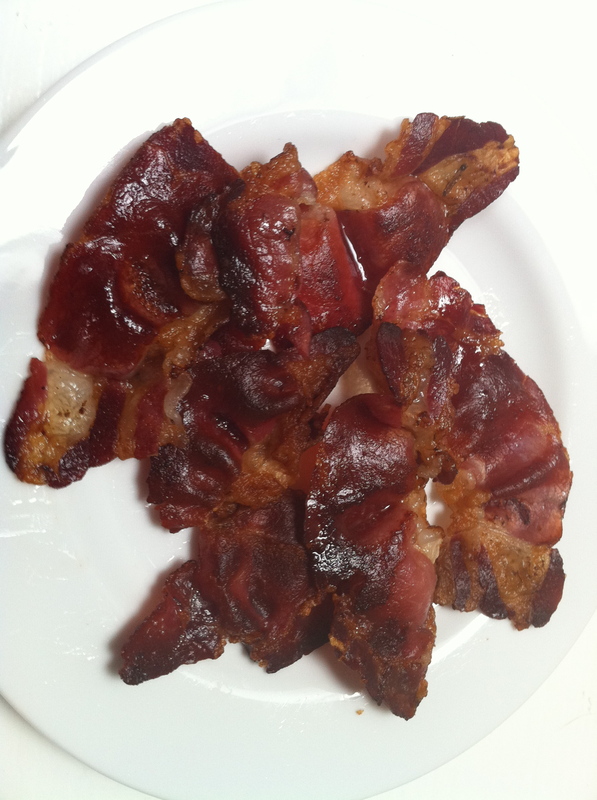 Last week I wrote about the ingredients listed in a packet of commercial bacon. It was in an effort to educate consumers about what they are eating and to try to make them question the provenance of their food. This week I have a test for you to try at home which will help to illustrate this further. Commander J likes her bacon crispy, hence so do I (luckily we agreed on this from day one) . We won’t debate the merits of crispy bacon vs sloppy rashers as this is one of those infinite debates that rivals how well done a steak should be, ketchup or mayo with chips, Beatles vs Stones etc – you know what I mean. I bought two packets of that “other” bacon and cooked them to the required level of instant disintegration. I also cooked up our flagship bacon product which is arrogantly named “Real Bacon” to test how much water is added to commercial bacon. This was something I decided to do for fun and the result was not measured scientifically and was based on one sample test but the outcome was interesting. Both packs of commercial bacon started off at 250g and after cooking to the same level of crispiness (based solely on my opinion) the average weight was 82.5g. What this means is that 67% of the product evaporates in the cooking process. The real bacon started at 160g and ended up at 80g – A loss of 50%. The end result was about 80g of crispy bacon in all 3 instances but the big difference is the starting weight. Try this at home if you are skeptical and if you are mathematically inclined and are tired of watching reruns on the series channel you can work out what you are paying per litre of water that is pumped into commercial bacon. I have not even mentioned the taste – That is a personal preference and I leave that experiment for you to do in your own way. This entry was posted in General, Welcome. Bookmark the permalink.